As human beings, we are supposed to consume a considerable amount of water per day to keep our bodies hydrated. 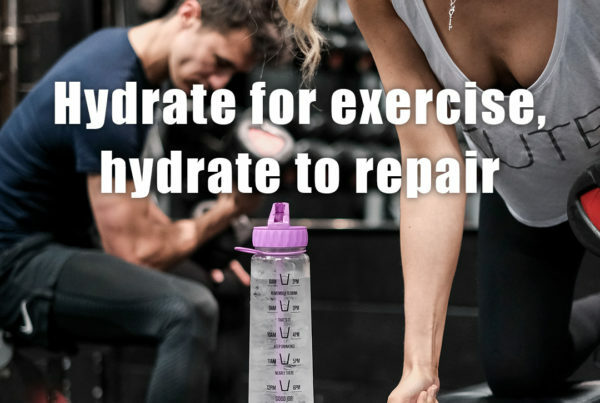 Our bodies are made up of more than 70 per cent water, and currently we are told that to stay hydrated, we must drink in the region of 8 glasses per day. What is not made clear is the fact that many fruit and vegetables have a high water composition, and this should be taken into consideration. 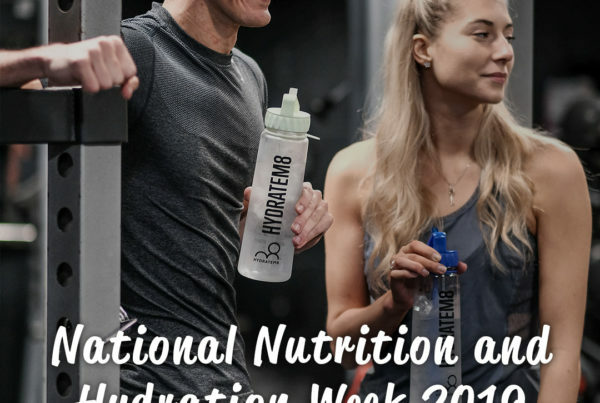 Fruit and vegetables also contain amino acids, vitamins, minerals, sugars and hydrating salts and could be compared with isotonic drinks that are used by athletes. 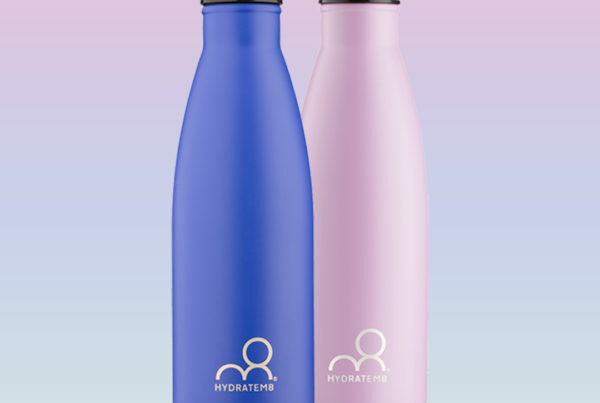 Research has shown, that this combination is actually more beneficial than water alone – a good way to use our Hydratem8 bottles as a fruit infusion container! 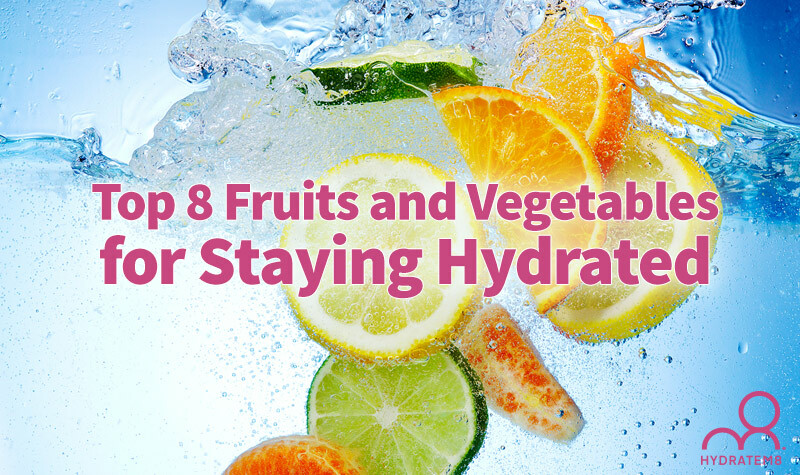 You will certainly get a double whammy if you combine both fruits and vegetables with water. Here are our ‘top of the pops’ list of the most beneficial fruit and vegetables to consume, particularly with extra water. Almost entirely ‘water with a crunch’, celery is not rich in macronutrients, but does contain approximately 95% water and are a good aid to digestion as well as hydration. It contains vital nutrients such as potassium and Vitamin K. A perfect appetite suppressant if you are trying to lose weight. This is the highest rating in water content, a whopping 96%, with no nasty ‘sat-fats’ or cholesterol. Good for the blood as they are very high in Vitamin B6 and Iron. The good old humble lettuce, which most of us find boring without a prawn cocktail, contains around 94% water, but very little nutrients to speak of. Other salad or vegetables leaves are more beneficial, such as spinach or kale, and can still aid hydration. Comprised of around 93% water, and a cucumbers’ ‘baby brother’, courgettes are an excellent source of hydration, best employed diced in a salad or a gazpacho, as cooking will remove a lot of the moisture. Low in calories, it is a dieters delight. When we say peppers, we do mean bell peppers, the kind of produce found in the UK in varying colours. They are high in antioxidants which combat many everyday illnesses and conditions, and contain 92% water. Best to eat organic with this particular vegetable, as a recent survey showed a difference between those organically grown and those that were not. Contain some high ranking vitamins such as C, B6, as well as folic acid and thiamine – essential vitamins and minerals for your body. Juicy and sweet, but be careful on your consumption of this delicious fruit, as it has a higher sugar content than other fruits. An excellent fruit to use as an anti-inflammatory aid as it contains bromelain. The ‘Pineapple Diet’ has featured heavily in the press over recent months as an aid to rapid weight loss – do it if you dare, but it doesn’t come with our blessing! Stick to using it sparingly either on its own or as a water infusion. Not just to be served with cream or in a dessert, Strawberries contain Vitamin C and are rich in folate which aids the growth of new cells in the body. Great infused in water, or also popular as a smoothie. At 91% water content and full of antioxidants, strawberries should feature high on your list for many reasons. This fruit is probably one of the best thirst quenchers and comprises 92% water and is almost certainly one of the best rehydrators you can consume. Delicious on its own or in whole grain salads and canapes. Serve this with feta cheese at your cocktail party and it will certainly help beat the dehydrating effect of alcohol.